When is it time to rope up on a snow climb? In general, when the overall risks to the climbing party of continuing unroped are higher than those of roping up. It's often an issue of trade-offs, weighing the pros and cons of both choices. 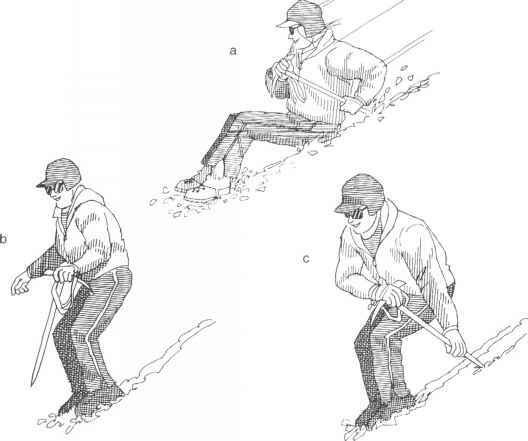 On a glacier, the risks to unroped climbers of falling into a crevasse clearly exceed the risks to the team of roping up. So teams rope up. As slopes steepen and snow hardens, the easy decisions disappear. It becomes a matter of deciding whether the risks to unroped climbers of being unable to stop their own individual falls exceed the risks to the team of roping up. These team risks are not trivial. They include the possibility of one person's fall pulling the entire rope team off the mountain and the danger that roped climbing will slow the climb, adding to avalanche and rockfall exposure and the likelihood of an unplanned bivouac. It becomes a delicate decision involving an evaluation of each climber's skills and the variety of alternatives for roped team protection.